January is Self Help Group Awareness Month! Self help groups are also known as support groups. If you live with a chronic medical condition, these groups can be important to provide social and emotional support about living with chronic disease, as well as learn helpful “insider tips” and tricks for mitigating some of the effects of your diagnosis. The nature of support groups are changing. While we may envision a circle of people gathered to discuss their problems, support groups really are gathered to discuss solutions! Support groups also do not all look like they used to—while some still meet in traditional environments like hospitals or clinics, many people now find support online through message boards, but more commonly, using hashtags on social networks like Twitter or Instagram, or even by finding groups on Facebook. Online friendships can still be a fantastic source of support—personally, in my asthma journey, I’ve acquired many friends because of reaching out online—some of these friendships have grown well beyond our diagnosis and a couple people I’ve met online are ones I now consider without a doubt to be my best friends! Here at My Identity Doctor, we LOVE to partner with self help and support groups! If you are a member or leader of a group and you feel your members could benefit from medical ID jewelry products, please contact us about setting up a partnership! We can produce engraved bracelets (all the same or unique for each member), in most cases at a discount, for your group members, or provide your group a coupon code. Learn more about our group programs here, but remember, if you don’t see something that fits, we can talk! Depending on your group and your financial needs, we may even also be able to provide a portion of the sales generated by your group back to cover your support group costs! For both leaders or members wishing to pass information on to their leaders, please contact Kerri to learn more and together with Jon we will set something up! We may also opt to feature some groups on this blog to raise awareness of their condition and their group. Self help or support groups are extremely important for physical, social and emotional wellbeing. We at MyIdentityDoctor would be honoured to play even a small role in your group’s story! If you’re an avid traveler, you know the importance of keeping tags on your luggage. One trip, I could not for the life of me find a luggage tag in my house! Fortunately my suitcase made it successfully through both flights, but I can’t say I wasn’t just a tiny bit nervous because it seemed like I was tempting fate! But, how well do you identify your medical items as yours? Certain items, like blood glucose test kits, zip cases for medications, oxygen tanks or compressor bags and CPAP machines, wheelchairs or walkers, or nebulizer compressors are important, especially when travelling. Any bags that contain medical supplies should be readily identified so that if they are lost, the urgency to return them and their contents is known. 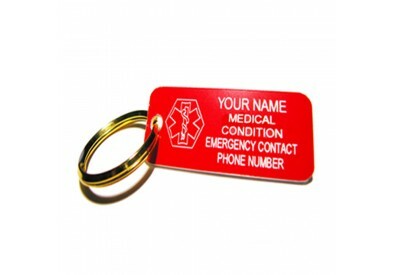 Our red medical ID key chains also double as excellent bag tags. I have one attached to my nebulizer bag—if someone finds it somewhere and does not know what it is, they will at least know that it is medical equipment, and hopefully take it somewhere where they will find a way to contact me and return my supplies! Most of us are very careful with our medical equipment—but, especially in the hustle and bustle of travel, things happen. By outfitting your equipment or medication bag with a medical tag, such as our bright red ones, you can have the peace of mind that anybody who finds your bag can get it back to you. A tag can also help people identify where to find the medication that you might need if you cannot get to it yourself. Our tags come in both plastic and aluminum versions, as well as a red-emblem stainless steel version. While all of our products are light, I have the plastic red tag on my nebulizer bag—it’s low profile and stays out of my way, but is bright enough to see when needed. Since this small carry bag for my neb stays within my carry-on bag most of the time, I don’t test the tag’s durability too much; however, if you are really rough on your bag (like I am on my backpack!) you may prefer the aluminum version for your journeys. And, unlike those those paper-insert plastic tags that sometimes only last one trip on your suitcase before the plastic cracks, these sturdy little tags will hold up to whatever you throw at them, just like the rest of our products. Okay, okay, bad pun. But, did you know that your keys can be the key to your medical ID? If there is no way you or your loved one are going to wear a bracelet or necklace or cannot wear one at work for one reason or another, a key tag may be a good alternative to consider. I also often suggest attaching key tags to shoes or clothing for kids, specifically children with autism or other sensory processing issues who may be sensitive to the feeling of a bracelet or necklace. A key tag can also be a good choice in addition to a bracelet or necklace for people may experience a change in their medical condition while driving—for example, while people with diabetes or epilepsy typically can drive safely with proper precautions, in the event of a medical emergency when driving, a medic or bystander may use your keys to turn off your vehicle’s ignition. In this event, they would be alerted to your medical condition—in some cases, potentially faster than they might see your medical alert bracelet or necklace! If you are using a key tag, you could also engrave one side of them to say “If found please call” and your phone number, so that if your keys are ever lost, they have a better chance of finding their way back to you! Our key tags come in three different shapes—circle and diamond in stainless steel, and rectangle in plastic—and are bright red so they are easy to see. I also use a My Identity Doctor key chain tag attached to the carrying bag for my nebulizer—that way, if I ever lose it, the information is there to get my pricey little machine back to me. Although I am careful, things can happen—which is why My Identity Doctor is here for you: no matter how careful we are… things can happen! Explore our key tag medical ID selection on our shop website! Loose pills in your pocket? We’ve got you covered. Okay, I do it too. I just do it slightly less now that I have a couple of pill boxes. How often have you slipped a pill in your pocket (in my case, that little good-for-what-else pocket of my jeans) and found it when you go to do laundry? It can’t be just me, right? 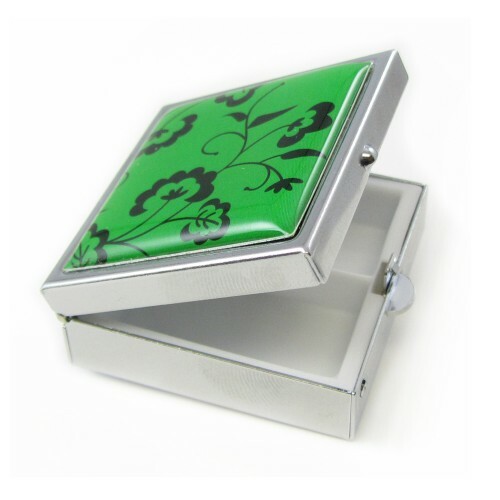 Not only do we provide high quality stainless steel medical ID jewelry, we also sell stainless steel pill boxes. Whether you are throwing them in your pocket or a backpack, these will not crack like the typical plastic drug store pill boxes might after a few months. Our boxes come in the typical rectangle, but also a round variation. For me, I find using a pill box in my pocket helps me to actually remember my midday pill in my pocket better, because I can feel it when I sit down or stand up, or dig in my pockets for change or a key. I carry my prescription pill, as well as a couple of pain tablets just in case—this has helped not only myself, but even my friends a time or two when a headache has come on unexpectedly! Another concern with loose pills in your pocket is if they fall out, children or pets may get to them by accident. With a pill box, you will be more easily able to notice if your pills fall out of your pocket. I keep one of my small boxes in my pocket (usually anyways) and one in my backpack as a backup. One time, I ended up at the cabin and thought I’d left my pencil case of meds at home—it turns out they were just buried but I did have to resort to my backup stash for a few days. It was quite a relief when I discovered a four day supply of one of my pills in the little box in my backpack—and a lot more space efficient than the whole pill bottle takes up!